The first book in a witty, suspenseful new series about a brilliant new crime-solving duo: the teen descendants of Sherlock Holmes and John Watson. This clever page-turner will appeal to fans of Maureen Johnson and Ally Carter. Jamie Watson has always been intrigued by Charlotte Holmes; after all, their great-great-great-grandfathers are one of the most infamous pairs in history. But the Holmes family has always been odd, and Charlotte is no exception. She's inherited Sherlock's volatility and some of his vices--and when Jamie and Charlotte end up at the same Connecticut boarding school, Charlotte makes it clear she's not looking for friends. But when a student they both have a history with dies under suspicious circumstances, ripped straight from the most terrifying of the Sherlock Holmes stories, Jamie can no longer afford to keep his distance. Danger is mounting and nowhere is safe--and the only people they can trust are each other. The last thing Jamie Watson wants is a rugby scholarship to Sherringford, a Connecticut prep school just an hour away from his estranged father. But that's not the only complication: Sherringford is also home to Charlotte Holmes, the famous detective's great-great-great-granddaughter, who has inherited not only Sherlock's genius but also his volatile temperament. From everything Jamie has heard about Charlotte, it seems safer to admire her from afar. From the moment they meet, there's a tense energy between them, and they seem more destined to be rivals than anything else. But when a Sherringford student dies under suspicious circumstances, ripped straight from the most terrifying of the Sherlock Holmes stories, Jamie can no longer afford to keep his distance. Jamie and Charlotte are being framed for murder, and only Charlotte can clear their names. But danger is mounting and nowhere is safe--and the only people they can trust are each other. 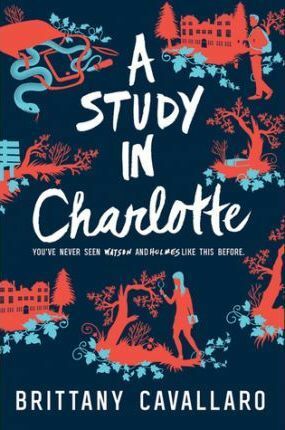 A Study in Charlotte is the first in a trilogy brimming with wit and edge-of-the-seat suspense. Brittany Cavallaro is a poet, fiction writer, and old-school Sherlockian. She is the author of the Charlotte Holmes novels as well as the poetry collection Girl-King and is the recipient of a National Endowment for the Arts fellowship. She earned her BA in literature from Middlebury College and her MFA in poetry from the University of Wisconsin-Madison. Currently, she's a PhD candidate in English literature at the University of Wisconsin-Milwaukee. She lives in Michigan with her husband, cat, and collection of deerstalker caps. Find her at her website, www.brittanycavallaro.com, or on Twitter @skippingstones.